Unlike traditional pipe and sewer repairs, trenchless plumbing options save your yard and your foundation. You don't have to deal with the ugly trenches that can rip through your lawn, driveway and other parts of your property. A Plumbers plumber can handle your problems from two small access points at either end of the pipeline. Best of all, your Plumbers plumbing team can handle your plumbing or sewer problem from start to finish with very little disruption to your normal routine. 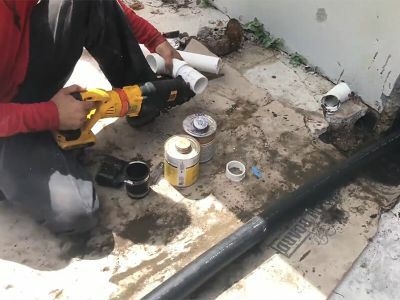 Trenchless Plumbers plumbing technology is a three step process that includes an evaluation of your existing plumbing system with sewer camera, clearing out of the old pipe and covering the pipe with an epoxy sealer. The result is a seamless pipe that covers any chinks, cracks or damage in the pipe or sewer line. Not only does traditional pipe replacement dig up your lawns – it sets you up for experiencing the same problems in 5 to 10 years. If the roots in your backyard trees made their way into your old pipes, they are bound to the do the same with your new traditional pipes. With trenchless plumbing and the epoxy lining, you can prevent this from happening again. You'll save money on your plumbing and sewer repairs. With trenchless plumbing, you eliminate the vast majority of your labor costs. There's no crew of workers digging up your lawn and driveway – and no costs afterwards when they have to put it all back when the work is done. When you factor in the longevity of a new epoxy lined pipe, you'll save even more money over the course of your homeownership.